Our unconventional approach to dark roasting creates an extremely smoky and piquant coffee. Intense. Never Bitter. Some places seem to use their French roasts as an opportunity to hide or obscure a lower quality coffee by roasting it so dark they remove all characteristics of origin, leaving only a cup that tastes of carbon and ash. 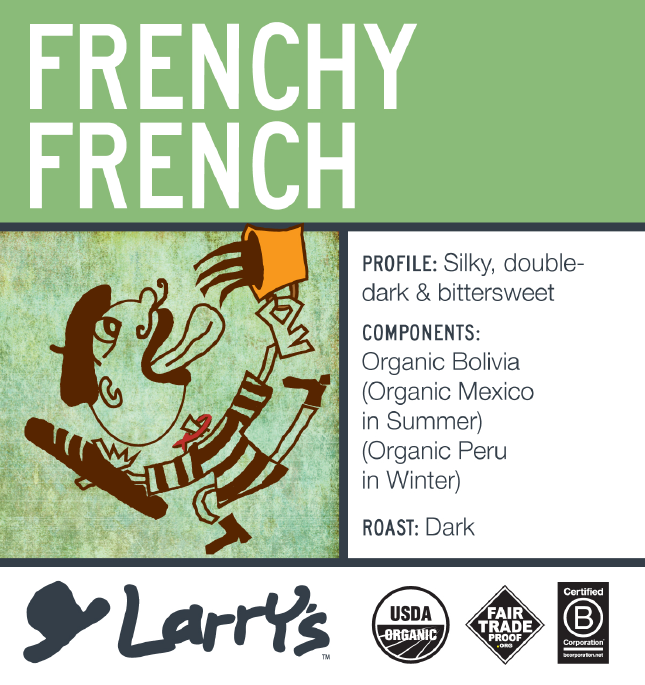 We don't see the point in that, so our Frenchy French Roast is a carefully selected coffee, usually from South America, that can withstand the high temperatures of the roast profile which takes it to that nice dark level. We take a slow and steady approach to the roast, allowing the beans natural sugars to caramelize nicely without burning. The result is BOLD, DARK, and RICH with a bittersweet chocolate undercurrent. Roasty and piquant with a warm, inviting aftertaste.